Love is one of the biggest decisions in your life. Discover your personal relationship roadmap and craft better strategies in your World of Love. Whether you are single, attached or anywhere in between, you will get to learn something valuable about your relationships. – What’s the best type of relationship for you, and are you ready for it? 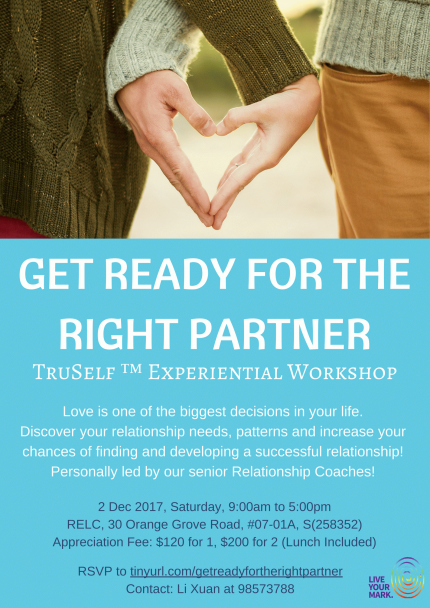 Come spend a day with our experienced relationship coaches in an interactive workshop, and discover how to increase your chances of finding the love you’re truly seeking, and how you can be ready for it. Please note that all tickets sold are non-refundable, as the venue and seats would be reserved for you upon registration. Thank you for your understanding. You may contact Li Xuan at 98573788 for more details! A Glimpse at the Relationship Coaches Leading the Session! Angela Tan is a relationship coach working with both individuals and couples in the domain of intimacy and relationships. As a trained and practicing medical doctor for the last decade, Angela offers insights based on core knowledge which provides certainty in her coaching. Over the years, her nurturing and endearing personality has allowed her clients to see and achieve more than what they thought was possible, thereby creating successes in their personal lives and the relationships around them. Loo Mei Yee, an established life coach in relationship development and training, helms the overall operations of the TruSelf™ Division at Executive Coach INternational. Warm, understanding, firm and extremely supportive in her clients' growth, Mei Yee mepowers her clients in achieving their dreams and goals with unwavering determination in career advancement, health and vitality improvement, and emotional mastery.